Terranea opens Solviva and expands its focus on hyper-local ingredients and in-house production. If I hadn’t know in advance that I was at a “wellness eatery” offering a “unique restorative experience“ with “food crafted to benefit the body and mind,” the dinner I enjoyed at the Terranea resort’s new Solviva could have convinced me that I was at one of L.A.’s globally minded neighborhood restaurants. Typically, a restaurant with its own nutritionist is a restaurant that makes me roll my eyes. But Solviva chef de cuisine RJ Dela Merced and nutritionist Navil Lorenzana have put together a menu of dishes I’m happy to eat. And, perhaps even more important, I didn’t feel the desire to go have another dinner after I ate at Solviva. Or, to put it another way: I’ve eaten spa cuisine around the country at health-oriented destinations like Canyon Ranch, but I didn’t find myself sucking on crunchy prawn heads at any of those other spots. Solviva, which is part of a beautiful oceanfront resort in Los Angeles County’s Rancho Palos Verdes, serves plancha prawns with fingerling tostones and Moroccan-spice vinaigrette. The heads, which arrive separated from the prawns, are full of flavor and nutrition. The waiter at Solviva, who explained that portions were smaller than those at Terranea’s other restaurants because the focus is on “giving you just what you need,” cheerfully told me that prawns have a lot of selenium, a mineral that helps protect DNA and also aids in wound healing. Solviva’s vegetarian mushroom flatbread comes with whipped ricotta, garlic confit, and Korean chile. A yellowtail crudo has kelp-soy shallots, jalapeño, and radish. This food pops with flavors that you might not expect from a restaurant adjacent to a high-end resort spa. Grass-fed lamb loin with fava beans, local red rice, onions, and Catalina View pinot noir sauce is a satisfying plate of California cuisine that, like the plancha prawns, is gluten-free. I drank a refreshing Samuel Smith strawberry ale from England while my dining companion happily sipped sustainable California zinfandel from Terranea wine director Alicia Ajolo’s beverage list, which also includes cocktails and many biodynamic wines. Terranea is where a team led by Bernard Ibarra, the resort’s vice president of culinary experiences and executive chef, has a sea-salt conversatory, harvests kelp, and tends its own plot of farmland at Catalina View Gardens a couple miles away from the hotel. 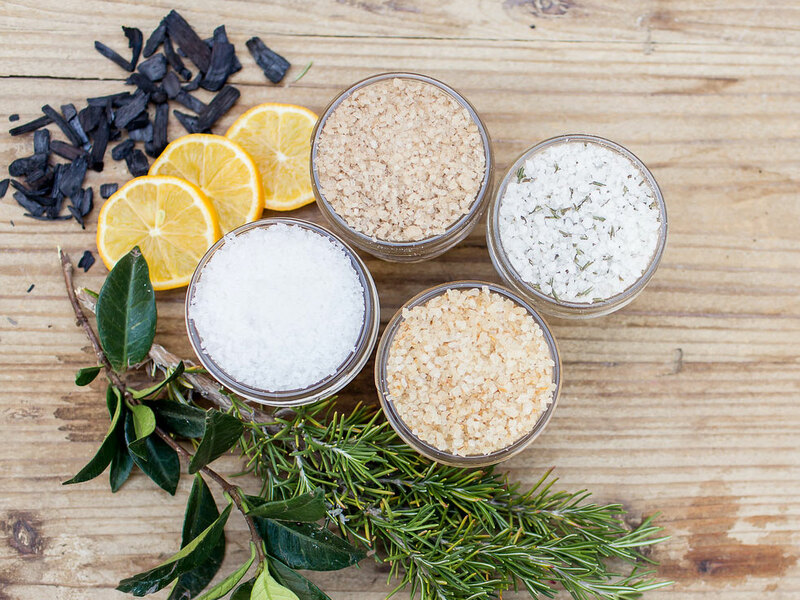 Terranea’s sea salt is a better form of salt than what most people typically consume, because “it’s all mother nature,” Ibarra adds. There’s no bleaching or anti-caking agents or heating. The conservatory yields about 350 pounds of salt every year, in roughly 9- to 10-pound batches that, depending on the weather, might require 10 days or more of evaporation. Recently, Terranea has been mixing kelp with some of the salt. “It makes for a healthier salt because now we add iodine to it,” Ibarra says. The chef, who grew up in the Basque Country, is in the middle of curing his own Bayonne-style ham. The process involves adjusting the temperature and humidity of a refrigerated chamber to simulate the seasonal changes involved with ham-making that originated during a time when there was no refrigeration. Ibarra walks me into his curing room and shows me hams rubbed with espelette and others rubbed with black pepper. He points to a ham that’s been washed in brandy and then in red wine. The room smells like meat, fat, spices, and funk. Ibarra started the year-long process of curing hams last June. He knows that many of the best things in life take time. The point, Ibarra says, is that many things are healthy if you consume the proper quantity. He has plans for other charcuterie like dry sausage and chorizo. In the meantime, Terranea is already making cheddar, parmesan, and goat cheese. Ibarra shows me cheddar that’s been aging for three years. After taking me through the ham and cheese, he drives me to Catalina View Gardens, where Terranea gets a lot of produce and also maintains its own garden plot. We pass by lemon trees that are full of fruit even though Terranea’s culinary team just harvested 800 pounds. And then you figure out how to prepare the literal fruits of your labor. Beyond Mar’sel and Solviva, Terranea’s restaurants include Catalina Kitchen (known for, among other things, Friday-night seafood buffets and Saturday breakfast buffets), Bashi (with good sushi and an array of stir-fries), and the casual Nelson’s. There’s also a lobby bar, the Sea Beans café/coffee shop, and poolside dining. Ingredients like lemons can go fast with so many chefs on property. Terranea is raising chicken for eggs. Plus, there are beehives at Catalina View Gardens. 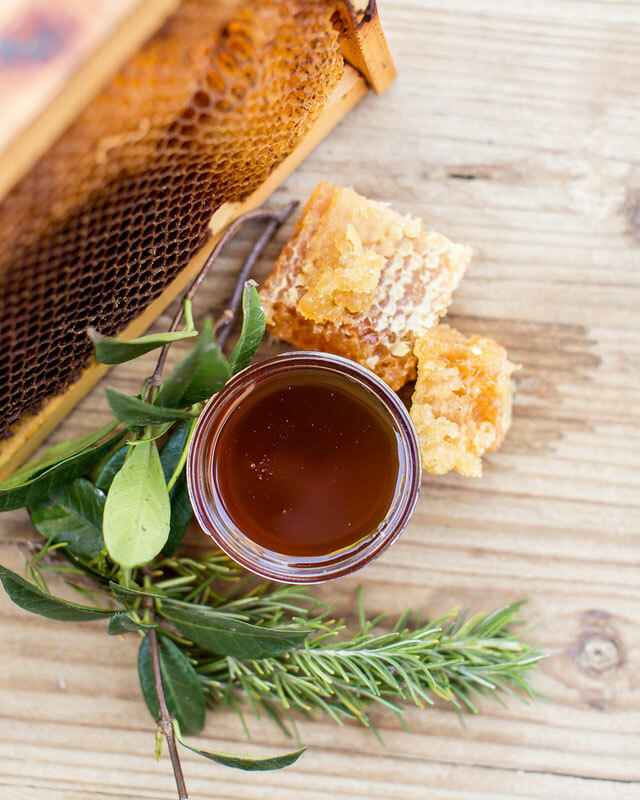 Terranea occasionally harvests some honey, but the main reason the bees are there is for pollination. This is about creating a sustainable ecosystem. Ibarra drives me toward Terranea’s garden plot, but he stops before we’re all the way there. It’s a muddy day, and he had once gotten a truck stuck while trying to drive up in similar circumstances. Today, we’re in a Terranea house Lexus, so we get out of the car and walk about 100 yards. Our shoes get muddy as we hike up to the garden. Like Ibarra says, your mindset changes when getting ingredients isn’t so easy. I see chickens eating kitchen scraps like cantaloupe, watermelon, and fennel. 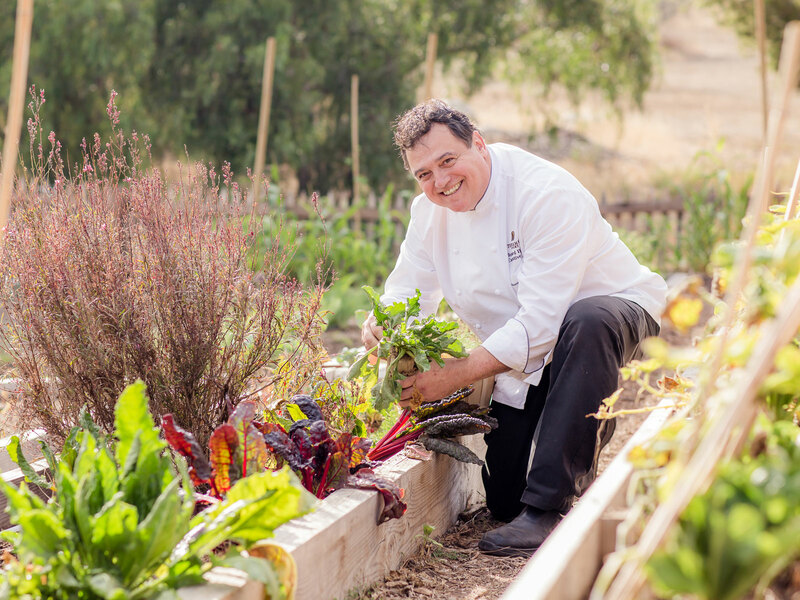 Then Blake Hale, a sous chef who works on Terranea’s garden, walks us through the plot and points out the lettuce, peas, mustard greens, and all the cover crops that are getting the soil ready for a big summer of growing. “This is a very important part of the farm, season-wise, but it’s not spectacular,” Ibarra says of the winter, when the garden is mainly a sea of green. What happens to the soil now will help create the rainbow of summer, when the garden can yield 1,500 pounds of produce like heirloom tomatoes, peppers, artichokes, beets, carrots, cucumbers, squash, and pumpkins. In the meantime, there are still some great crops growing in the winter, like Brussels sprouts set inside old hay bales. The hay itself will break down and add richness to the soil. Hale also shows me fava beans, a big patch of dill, and a passion fruit tree. We stop by some perfectly crisp pea tendrils. Ibarra hands me one, and I’m gobsmacked by the sweetness. Hale texts Vaughan to tell him that Mar’sel will soon be getting some tendrils. When I eat dinner at Mar’sel that night, Vaughan is using the pea tendrils in a spectacular dish with clams, Alaskan king crab, ham hock, and mirin. Before they did all this, they picked about 25 pounds of radishes from their own garden. A big part of Terranea’s ethos involves understanding how things begin. It’s a balancing act at Mar’sel, where many resort guests want things like lobster, filet mignon, and branzino while Vaughan tries to do a different tasting menu every month. He’s got a black-truffle tasting menu at the moment. He’s about to start serving a vegan tasting menu. Meanwhile, Mar’sel’s à la carte lobster entrée comes with burrata, uni, handmade pappardelle, butternut squash purée, and golden raisins. It’s a symphony of a dish that’s about land and ocean and their intersection on the California coast. Vaughan is strikingly adept at cooking seasonally: Wild fennel soup (with bee pollen, nasturtiums, and pine nuts) and calamarata Bolognese featuring short rib are comforting crowd-pleasers for cold winter nights. Ajolo’s beverage pairings add even more grace and comfort. “The main storyline is connectivity,” says Ajolo, who’s always happy to tell guests the stories of the winemakers she champions. She wants her beverage list to showcase “things that people have forgotten about, like chenin blanc” from Jacky Blot in France’s Loire Valley. Ajolo wants Terranea’s guests to learn about independent female winemakers like Mimi Casteel of Oregon’s Hope Well Wine. She wants to surprise people by having sake at Mar’sel. She wants to offer a taste of exclusivity with champagne that Piper-Heidsieck and Terranea created exclusively for the resort. That champagne, Ajolo says, pairs well with a variety of dishes, including barbecue shrimp that’s a nod to Vaughan’s New Orleans roots. Terranea will start serving its own single-barrel Jack Daniels soon. Cocktails at the resort often involve garnishes, like rosemary, that are picked at Terranea’s garden. Ibarra and his team also harvest olives. Terranea has an annual olive-oil festival every October. There’s a lot of planning ahead when you have a resort with such culinary ambitions. But sometimes, you let the garden tell you exactly what you should do that same day.